Brad Ray of Premiere Breeding Services in Colorado, one of the world’s top experts in equine reproduction, has pronounced Nunki healthy and a good candidate for egg harvest. 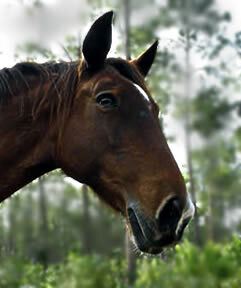 We can now move ahead to save the Abaco Spanish Colonial horse that is found only here on Abaco. Mr.Ray and Dr. Derrick Bailey (our local vet here in Abaco who has had large animal experience) completed a sonogram survey of Nunki’s repro system. Plans are being detailed for Mr. Ray to come back, with an additional vet and an assistant, to collect eggs from Nunki in two phases. The eggs will be flown to a lab at Texas A&M where another expert has agreed to store the eggs, and when we have sperm from appropriate DNA compatible stallions, the eggs will be joined with the sperm to form embryos which will be placed in surrogate mares. The pregnant mares will be transported here to Abaco to have their foals in the environment that will be their home. Dr. Gus Cothran of The Texas A&M University College of Veterinary Medicine & Biomedical Sciences has worked with us for years and he is overseeing the stallion selection process. We are incredibly excited about this hope for Nunki’s future, and the future of the Abaco Wild Horses. While we are blessed to be receiving a great deal of very costly reproductive work pro bono, there will be great expenses in implementing the plan. As they come together, we will post the plans, post various fund raising venues and keep everyone in the loop who wants to be a part of this international effort. People around the globe will be tuning in as we work to bring a wonderful breed of horse back from the edge of extinction. Join us, become part of this world wide effort. Get ready to join Team Nunki! Details coming!